I've been plugging away at more organizing in my home. I seriously don't think it will EVER be completely done. It's kind of like decorating for me, it never seems to be finished. When or IF I ever finish organizing or decorating my home, I can almost guarantee, that will be the exact time that I'm ready for a change or I've thought up a new and better way to organize this area or that area, thus NEVER being completely finished. BUT that's okay. Organizing is a little by little, baby step process. Start with the little stuff. Like a little closet, or a little cupboard or drawer. Something that is doable in a short amount of time. Once you complete the one area, I bet you'll want to complete something else. 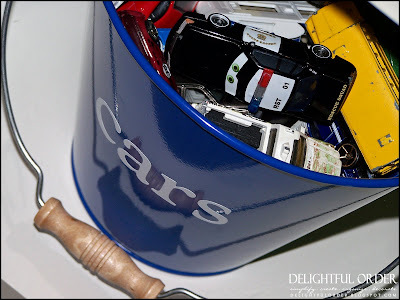 Pottery Barn has the coolest storage for toys!! I Love.Love.Love. most of their playrooms and their storage! However, what I do not Love, is the price. 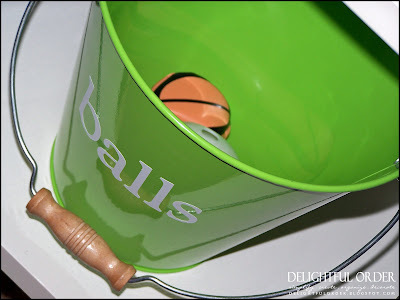 So I was extremely excited to find some cute metal pails (at Target) to get the look that I was going for. They aren't real big, so I store smaller items in them. But for $2.50 a piece (I think that's how much they are) they are perfectly cute and perfectly priced for the little toys! 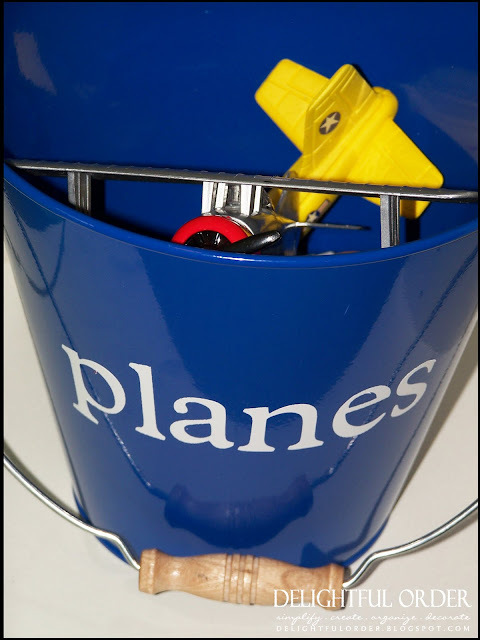 My next post will show you how I store the bigger toys. I cut the vinyl letters with my cricut and the Plantin SchoolBook cartridge. 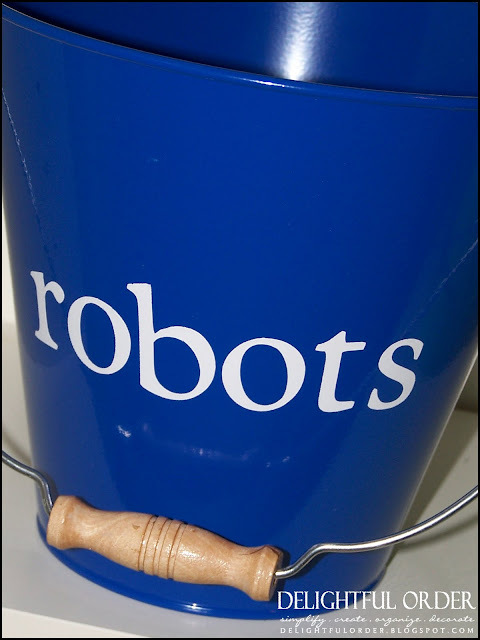 and it's so perfect, because my boys can grab the handle and bring the bucket with them wherever they want to play with the toys. More of this playroom coming soon, along with Part 2 of storing toys and some fun wall art and more. Do tell me, how do you contain your children's toys? I'm a huge PBK fan as well. Our playroom built-ins are decorated with baskets and canvas bins from there (that was my splurge for that part of our finished basement). I will often wait until they are marked down or sometimes I splurge! 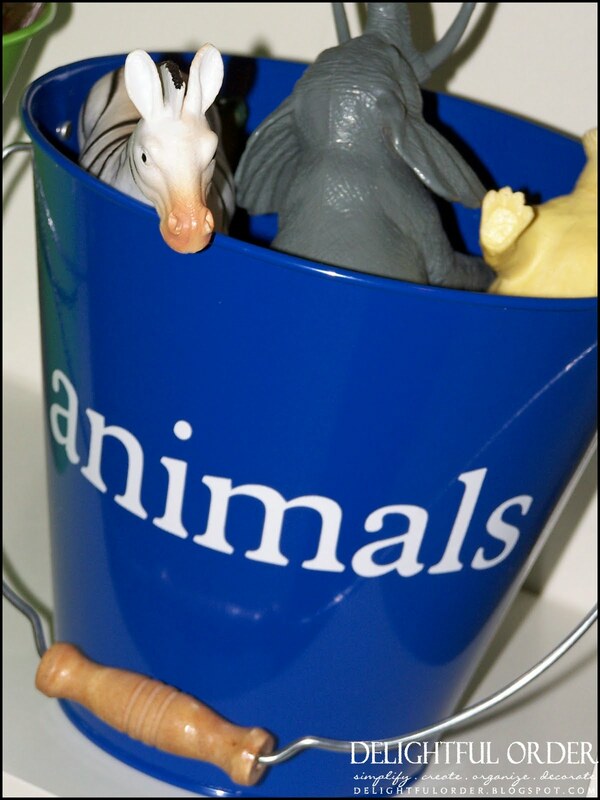 I love the pails you posted too from Target. I need to get myself a cricut or silhouette! I found you via Under the Table and Dreaming. I am in love with your blog! Now following via Google Reader! 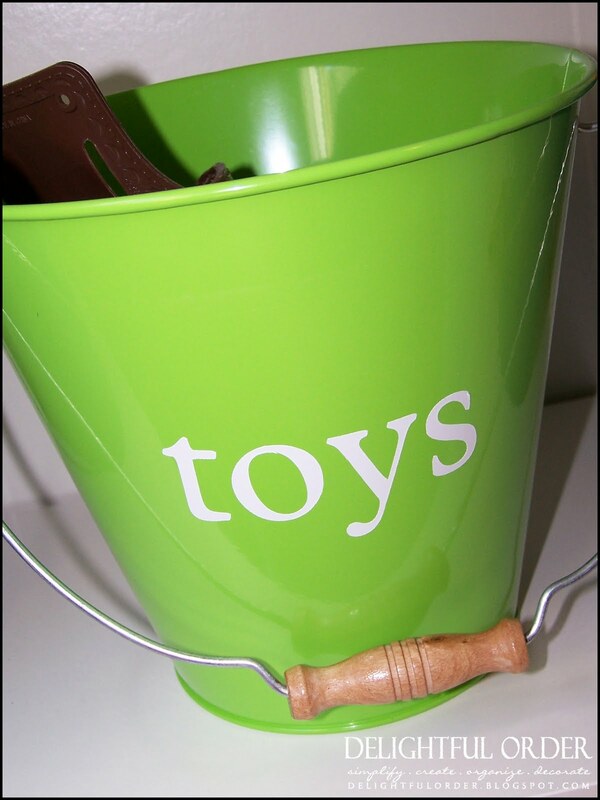 I have my kids store their toys in buckets and baskets and containers of all sorts as well. Those buckets from Target are really cute. I'm going to have to go check them out today! For my son who is 3 and can't read yet, I've made laminated labels with pictures and attached them to the containers. I actually did the same for my 6 year old daughter. I love how it looks and it makes their room look better and organized. Thanks for all the great ideas, I check your blog everyday! I've done various methods of toy storage, and as long as I consistently train my little ones to pick up after themselves, they all work fine. The one thing I like to do no matter what, is not only use laminated labels, but adhesive velcro dots under the labels so I can change things around as needed. Love your ideas here, as always! I'm still in the toy frustration department. All systems I've tried either look messy or distracting as our toy area is in the living room. What is working best now is (a)the couch moved out from the wall with bigger toys behind it when they are not in use so I can't see them (b)a nice dresser for smaller items, with compartments to sort stuff within the drawers (c)minimal toys in the room so there isn't an overwhelming amount to be laying around/pick up (rotate them). Bins and baskets work well for other things in our house, but for toys I find they just overflow and don't look so good the majority of the time. Hello, I found this website while I was looking for web sites related to Online toy shops. On the other hand., parents understand the stress of trying to keep toys organized and teaching children the importance of organizing. 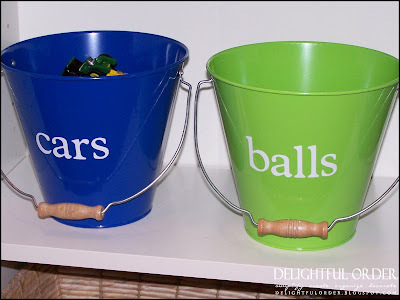 I think placing the toys in these colourful pails are great ways to keep the space tidy. I did a playroom makeover for a little girl a few years ago that I posted on my blog some time ago and it's still a popular post. I had a whole room to work with and just kept the organization simple and made it easy to put things away. It still works today and is still clean and organized. You have such great ideas for storage. So simple but so stylish! I wish I had your abilities, I dont! So I will just have to use you for inspiration instead!!! Cute buckets! I knew I needed a cricut for something! I've been working on our playroom, and while it's improved, it's certainly not as cute as what you've shown so far! I just found your blog, and I am loving it!! This is awesome! I love your projects! My home is in desperate need of organizing. I'm just not sure where to start.